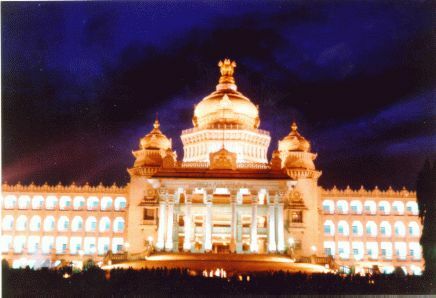 Seat of the Government of the Indian State of Karnataka. The nerve centre of India's I.T. Industry. Bangalore. Garden City, Silicon Valley, Pensioner's Paradise, Air-conditioned city, Pub City, Science City etc. etc. This city has so many epithets that its been adorned with another epithet 'The City of Apellations'. Known for its salubrious climate, gardens, pubs and software companies, Bangalore, the capital of the Indian state of Karnataka is one of the most cosmopolitan cities in India and the fastest growing city in Asia. Home to some of the best gardens(Lalbagh, Cubbon Park, Cariappa Park etc.) in the country, its also base to the finest research institutions(Indian Institute of Science, Indian Space Research Organisation, National Aerospace Laboratories, Defence Research and Development Organisation, Aeronautical Development Establishment etc.) of the nation. It also houses the Indian operations of most of India's and the world's leading Information Technology corporates(Infosys, WIPRO, Oracle, Lucent, Motorola, Cisco, Intel, Sun, Apple, IBM, Hewlett-Packard, Texas Instruments, Novell, Nortel, SAP, Compaq, Dell, GE etc.). Its also home to me. In the wake of unprecedented growth, Bangalore is struggling to retain its charm of yesteryears and is faced with increasing pollution and urban chaos. Your own space on the net to gab about Bangalore.